Actually, this is Alyce’s BBQ Chicken Pizza! As a girl who loves to take pictures of food (it only started out with wanting to write about it), I don’t know how I missed being involved in Foodspotting, a website and way of life devoted to not just sharing the names of good restaurants (with our now ubiquitous and often ambiguous reviews), but to sharing the best dishes at those restaurants. Oddly enough, in the whirl around the net, I guess I had signed up on Foodspotting, but never got around to actually participating. So, in order to write my post for our group-blogging of Gourmet Live’s 50 Women Game-Changers in Food (#49, Soraya Darabi & Alexa Andrzejewski, ) this week, I had to go on the Foodspotter’s website and see what it was all about. Because I’m watching my weight carefully just now, and because I LOVE IT, I decided to put in “St. Paul” and “pizza” to see what would come up. (Any reason for a night “off” from the diet.) Give it a whirl for yourself. Put in your favorite place and your favorite meal and see what pops up. See if you agree. See if you’d like to add YOUR favorite meal in town or if you’ll make the decision to go to that restaurant and try that dish? And why not? One funny thing: I was not looking for The Happy Gnome, which is one of my favorite restaurants in St. Paul. 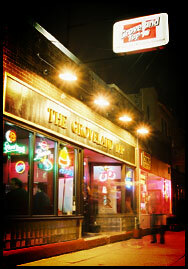 I live smack in the middle of the city (in the Mac-Groveland neighborhood) and we have tons of choices. I adore our neighborhood pub, 1/2 block down from our house (The Groveland Tap) where we stop for a drink or meet friends for a burger and I’m always thrilled to go to Cafe 128 for a perfectly-paired dinner or a wine-tasting over on Cleveland near the University of St. Thomas, where I’ve done some graduate work in music. In good weather, I sometimes sit outside with coffee to write here. Dave tasted 40 beers here and won a shirt. He’s starting over now to build his wardrobe. 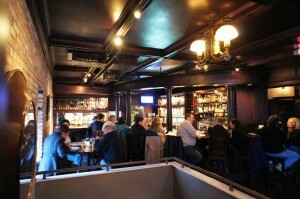 The back room at Cafe 128–wine tastings and special dinners are here. Make sure to get a reservation. But the Happy Gnome is another place entirely. It’s kind of between The Tap and Cafe 128, though not physically. (They’re all within a couple of mile of one another.) It’s maybe a cross between the two, though it’s called a “gastro pub.” There’s a wonderful, well-appointed bar with perfect music (saying a lot for me), but also the food is thoughtful, well-prepared, tasty, in season, seasoned beautifully (no salt or pepper on the table), is priced fairly, and is served by people happy in their work. The wine list is even and balanced and there’s a good by-the-glass list. They’ll tell you if a bottle’s been open too long. It’s a spot for happy hour, a special dinner, or Sunday brunch. But it’s not, as far as I knew, a place for pizza. So I was surprised to see pizza on Foodspotting for The Happy Gnome. Pleasantly surprised and ready for the challenge. Here’s the Happy Gnome dinner menu. Just so you can see. The Happy Gnome Firehouse Room. The restaurant’s in an old firehouse. 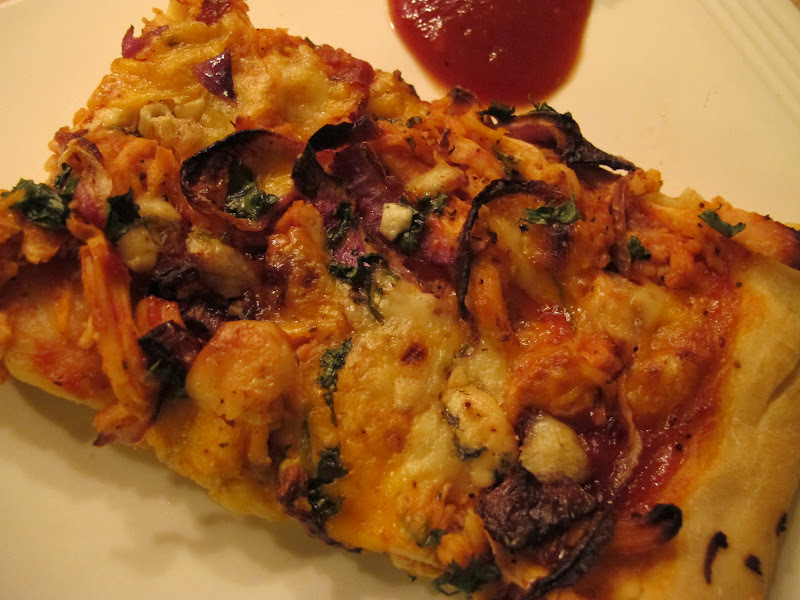 And here’s the photo (below) of their BBQ Chicken Pizza from the Foodspotting website, which I’m thinking is an item found on the menu occasionally. I’m guessing they switch out their pizza choice. Right now, Duck Pizza (yes) is the option. Whatever, I was happy to create a recipe and make my own. I got on fb and asked BBQ Chicken Peeps to speak up about what went on BBQ Chicken Pizza, which I’ve never eaten. I used their input to develop my bbq pizza. Happy Gnome BBQ Chicken Pizza –Photo from Foodspotting, where photos needn’t be perfect. 1. 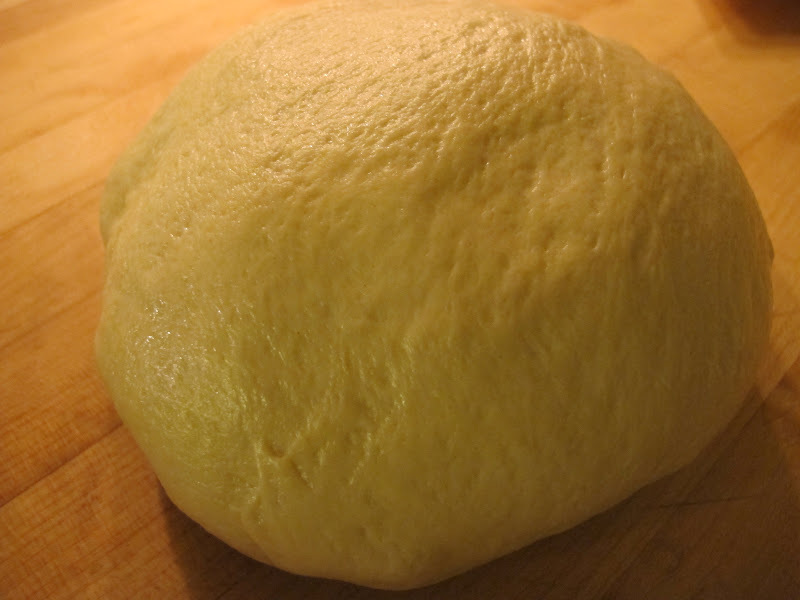 Make Tyler Florence’s pizza dough. It must rise 1 – 1 1/2 hours until doubled. (Alternately, buy pizza dough from your favorite pizzeria.) Makes enough for two. If you’d like to keep the second piece of dough for another time, divide the dough before it rises and freeze one half well-wrapped in plastic-wrap and then placed in a freezer bag. Freeze for no more than a month or so. 2. Meantime, roast 2 chicken breasts with skin on the bone: Preheat oven to 350. Place breasts on a baking sheet and brush chicken with olive oil and season generously with salt and pepper. Bake about 45 minutes and set to cool for a few minutes. Remove skin, debone, and shred the chicken. You should have 2-3 cups of chicken after shredding. Place in refrigerator until dough has risen and BBQ sauce is done. Combine all in a large sauce pan, stir, and bring to a boil. Lower the heat and simmer 30 minutes. Remove from heat and reserve until dough is risen. (Keeps well for several weeks in the refrigerator and is great for ribs or brisket, too.) Sauce recipe courtesy BYTES : COLORADO’S FAMILY-FRIENDLY COOKBOOK. 3. Chop or shred 1/2 cup each: extra-sharp Cheddar, Blue, and Pepper Jack cheese. Set aside. 4. Saute or carmelize (if you have the time) 1 large red onion, thinly sliced, in 1 T olive oil. Remove from heat. 5. Chop 1/4 cup fresh cilantro and reserve. 6. When dough has doubled in size, preheat oven to 450 degrees F. Place jellyroll pan (or half sheet pan) in oven to heat for about 8 minutes. Remove from oven and drizzle, then brush, bottom of pan with olive oil. 7. While pan heats, stretch the pizza dough into a rectangle just a bit bigger than the bottom of the jellyroll pan. Yes, you’ll need to be the pizza man here. No flipping up in the air required, but holding it up in the air (like you’re holding a shirt to see if there’s stains on it) and repeating on all four sides will work. Keep at it; you’re a novice (or not). It’ll get there. 8. Place the stretched dough carefully onto the hot pan and press dough up sides of pan if possible. 9. Spoon about a cup of BBQ sauce evenly over the dough. Remove the chicken from the refrigerator and stir about a tablespoon of sauce into it. Spread the chicken evenly on top of the sauce and sprinkle with the reserved onions. 10. Sprinkle the cheeses evenly over the chicken and onions and top with the chopped cilantro. Dust with a bit of kosher salt and fresh ground black pepper. 11. Bake about 15 minutes until bubbly and crust is browned to your liking. 12. Let sit 2 minutes or so before slicing. Serve with a couple tablespoons of BBQ sauce for dipping the crust. Alexa first came up with the idea for Foodspotting because she couldn’t find good Okonomiyaki in San Francisco. Before launching Foodspotting in 2010, Alexa was a User Experience Designer for Adaptive Path where she helped clients ranging from startups to established companies reimagine products from the ground up. Soraya Darabi loves food, travel, photography and emerging technology, so naturally she was one of the earliest foodspotting devotees, before becoming an advisor to the company and now a co-founder. She previously worked for Epicurious.com and drop.io, but most notably The New York Times where she successfully launched the social-media presences of The Times. I share this blogging journey with a fun group of foodies; read up! We’re almost at the end of a phenomenal trip. This segment allowed us to think outside the box and explore our own neighbourhoods, such fun!! Your pizza looks way, way better, Alyce! That's the problem with Foodspotting. If you're supposed to make a decision based on a photo, they better be darn good ones.This was a fun game changer as we all probably got the app and tried it out in towns around us. Oh my – must try this place out – I love how different this is. We lived in MacGroveland and moved for more space but miss that neighborhood – we frequently visit. Nice to have a pizza recipe that doesn't require a stone… keep meaning to get one and – never do. @Barbara I used the Foodspotting online, but haven't added the app to my first genration iphone that's already apped out! I'll see what I think; it does seem like fun. But does anyone feel like…despite the fact that we're food bloggers that running around photographing food in restaurants is just a tad over the top???! !I did have a hard time making the decision on the basis of the photo. The photo wasn't good, but I KNEW the restaurant had top-flight food so tried it. 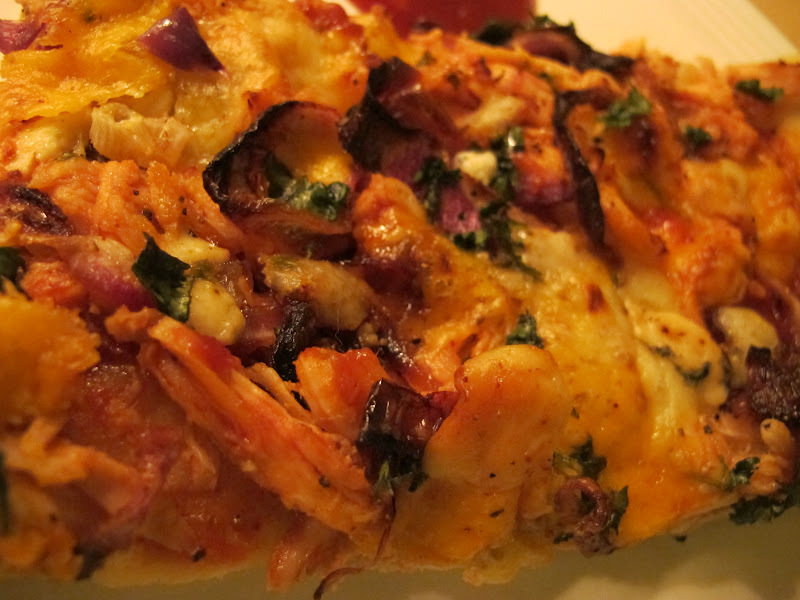 What a great way to feature Foodspotting…I am in love with the Chicken Barbecue Pizza, incredible looking! What a fun pizza! Making your own is always such a step out there into creative cooking! Too bad you couldn't compare yours to the Gnome's version! Yours looks better (frankly)! I've never been a fan of BBQ chicken pizza, but yours looks delicious! All of those cheeses would be enough to get me to try it, but what sold me is your sauce recipe. Being from the Kansas City area, where barbecue sauce runs in our blood, you're looks like it would taste great. BBQ chicken sounds good. We used to have a great pizza place nearby that a variety of unusual, but very tasty pizza. Unfortunately they sold the business and the new owners changed it. What a loss.